Despite its wonderful design, this monitor lacks color quality, image quality, and its response time is only 4ms. 2015 is the year of curved devices and Samsung seems to be leading the charge. Samsung's newest monitor, the 27-inch curved LED SD590CS, is gorgeously designed and easy to use. Unfortunately, the SD590CS is quite costly for a non-4K monitor. 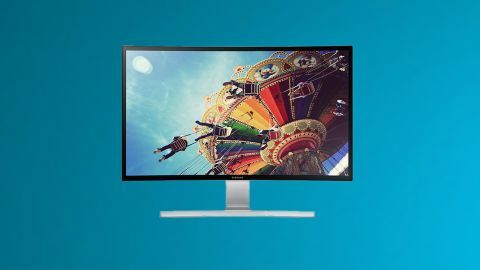 With 4K monitors like the the 27-inch Viewsonic VX2880ml ($600, £399, AU$765), Samsung's own gaming-centric 28-inch UD590 ($679, £429, AU$782), and the 28-inch Philips Brilliance 288P with a TN panel ($530, £345, AU$680), it's hard to justify spending $429.99 (£278.26, AU$548.83), for a 27-inch monitor that isn't 4K. The SD590CS features a minimalist design that is composed of a single metallic T-stand base that is elegant and simple. It is incredibly easy to set up - the base screws in with the neck (which uses thumb screws - though a screwdriver will make it secure) and the neck slides into the base of the monitor. The bezel surrounding the monitor features a superb glossy black finish, and the metallic base accentuates the black for a nice design aesthetic. I would have liked a solid metal around the entirety of the monitor to create a bit of contrast, but the glossy black texture is easy on the eyes. The base of the SD590CS tilts horizontally at -2 degrees to +20 degrees but does not rotate vertically. The lack of vertical manipulation is disappointing, especially at this price point, but the functionality would be added at the sacrifice of the design aesthetic. The SD590CS monitor weighs an amazing 12.32lbs (5.59kg) with a stand, and 11lbs (4.99kg) without a stand. The SD590CS is a surprisingly light monitor for it's size, and it is easily portable. The SD590CS is a VA Curved 4000R Panel with a viewability of 178 degrees from the sides of the device. Samsung gave the SD590CS a resolution of 1920 x 1080 with a natural aspect ratio of 16:9. Along with this, the SD590CS monitor has 3000:1 static contrast ratio and it uses Mega DCR for dynamic contrast ratio. The model features 16.7M color support a 4ms gray-to-gray response time. The SD590CS comes with five-watt built-in speakers and has ports for 1 HDMI, 1 DisplayPort, 1 VGA, 1 Audio In, and 1 Optical Audio Out. I would have preferred the VGA to be removed in favor of a DVI connection.